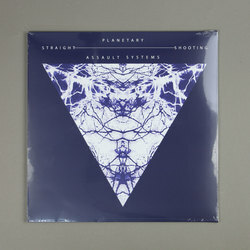 Planetary Assault Systems - Straight Shooting. Vinyl LP. Bleep. The Straight Shooting EP might be the first Planetary Assault Systems drop for couple of years, but it feels like Luke Slater has never been away. In a sense this is true - Slater is always busy with a project - but it’s also because the Planetary Assault Systems sound has become such an archetype in minimal techno that its influence can be felt everywhere. Always anchored to driving drums, Straight Shooting sees Slater build once again on the mid-90’s innovations of Robert Hood. Despite having many imitators, the trippy traxx Slater offers up here serve as a reminder that there are still few who can do it as well as he.